True, the name can seem a bit daunting to the untrained eye. But break it down, say it a few times out loud and it will become much easier. Honestly. Heinzelmännchen, or Heinzelmaennchen in new German, is pronounced pretty much like "Hine-tzel-men-shen." According to tales, theorists, bedtime stories from wise Omas (grandmothers) and more, the Heinzelmännchen originated in Germany and Austria hundreds of years ago. There are often references to their originating from an area deep in a forest in Central Europe that the Romans had been unable to conquer - no matter how hard they tried. Some believe the Heinzelmännchen are still around. They are the secret people, a highly talented and industrious lot who came out of their hiding places at night to do the work, or chores, of deserving humans. Frequently seen as helpful, they may also appear as mischievous or even mean. Their stature in lore has ranged from that of insect size to the height of a man. Their homes are thought to have been deep in the forests under the roots of trees and underground. Heinrich Schlitt, one of the most popular Mettlach artists of all time, loved portraying these wonderful creatures on steins. He painted in oils and produced artwork for postcards as well. Professor J.A. Schmoll described Heinrich as the "Walt Disney of the 19th Century." 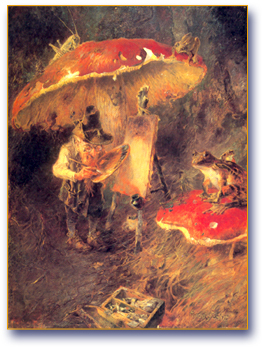 He, among many other German artists in a multitude of companies, have helped to "capture" the Heinzelmännchen for future generations to enjoy. "Heinzelmännchen," Prosit, Stein Collectors International, Inc. September, 1990. "A Rebuttal: Heinzelmännchen," Prosit, Stein Collectors International, Inc. June, 1991. "The Cölln - Cologne Connection," Prosit, Stein Collectors International, Inc. December, 1991.